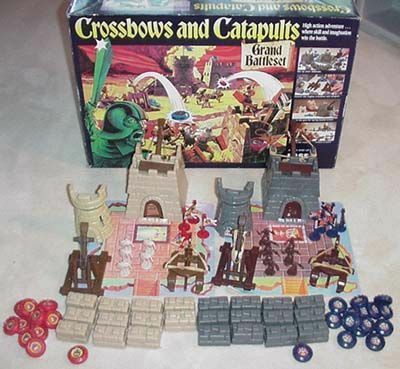 Crossbows and Catapults is a game which will spark many memories that we have completely erased from our brains. This was the case for me after recently finding a piece from the game in a chest full of crap from the 80's. This game was very popular at the time and I (as well as lots of people) had it. If you wasn't born in time or was alive at the time and never had it.. you missed out big time. The game was such a great idea many companies bought the rights and re made this game over and over again. From what I believe there is a new updated version in the United States which is still available. The game came packed inside a massive box which like all 80's board games had amazing box cover artwork which just hooked you in the first time you laid eyes on it. So the object of the game was to set up your camps of either barbarians or savages by strategically placing them along with the brick walls and firing apparatus. 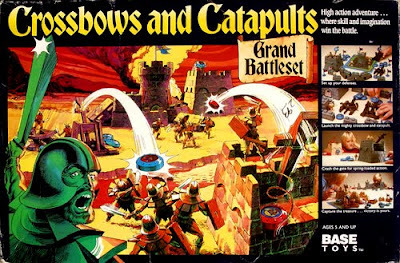 The aim of the game was to take turns at firing the crossbows and catapults at the other camp until everyone was dead and everything was destroyed. The weapons that were used to unleash hell on the opposing side were very well made. Using elastic bands for tension the catapults and crossbows shot discs at targets with a very good level of power and accuracy. The game also had these towers which when the door is hit from a shot activates a bumper on the top which will make any figure standing on top go flying to his death. The games figures were of a pretty decent standard but not as good as Dungeons Dragons or Hero Quests figures in terms of detail. 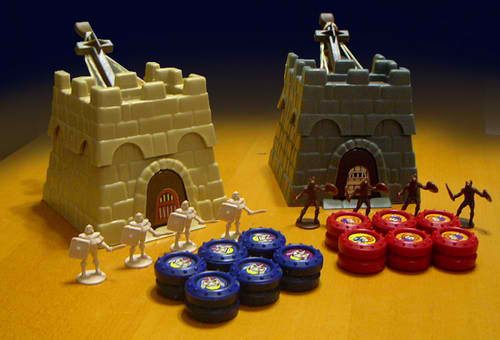 Many expansion packs were released which included horses and all other types of new accessories which were fun to annihilate with plastic discs. Crossbows and Catapults had a good run all the way through the 80's before dying out in the early 90's to become yet another Lost Entertainment gem.